Pink Floyd’s giant inflatable flying pig has appeared once again above the London skyline to celebrate the reissue of the band’s back catalogue including the classic album The Dark Side of the Moon. 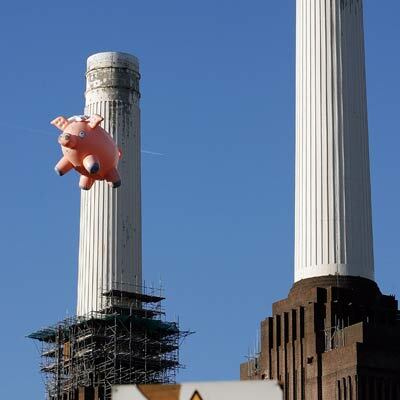 The 30 foot long porker is a replica of the original stage prop that featured on the sleeve of the iconic Animals album, floating above the towers of the Battersea Power Station. The pig was constructed in Germany by the same company that made the Zeppelins. When it was launched in December 1976 a hired marksman was on hand, armed with a rifle loaded with dum-dum bullets. But as the band and assembled photographers watched in horror, one of the guiding lines broke and the pig floated off into the sky. This triggered off one of the strangest UFO flaps on record, courtesy of a band who cut their teeth in London’s underground UFO club during the sixties. The first sighting came from a pilot who reported having spotted a flying pig on landing at Heathrow airport. According to some reports, he was given a breath test before his sighting was taken seriously. Minutes later the pig was spotted by a police helicopter which followed it to 5,000 feet above the capital. People in Croydon and Brixton were also watching a strange object in the sky and called the MoD to file UFO reports. The Civil Aviation Authority put out an alert to all pilots that “a 40 foot long, pink flying pig” was on the loose over the city and it was last seen on radar near Chatham in Kent at a height of 18,000 feet, heading east towards Germany (was it a homing pig?). But this UFO quickly became an Identified Flying Object. The pig came to earth in a field at Chatham in Kent and the rest is history. Pigs might fly…. This entry was posted in Uncategorized and tagged Animals, Civil Aviation Authority, flying pig, Ministry of Defence, Pink Floyd, The Dark Side of the Moon, The National Archives, UFO, Zeppelins. Bookmark the permalink.